Vumbura can offer both water and land activities as this area has scenic waterways and is also close to the Okavango's outermost open savannahs. 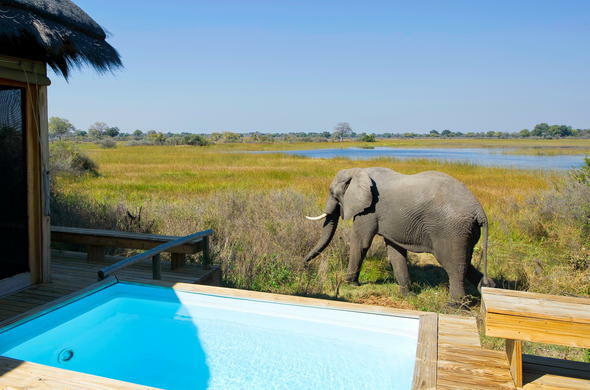 The new Vumbura Plains Camp is a luxury tented camp situated to the north-east of Mombo, in a private concession bordering the Moremi Game Reserve in the extreme north of the Okavango Delta. The Vumbura Reserve offers both land and water activities in a park that has a wonderful variety of habitats and a great diversity of wildlife and offers an enormous traversing area of close on 130 000 acres. The main activity at Vumbura Plains is game viewing in wonderful and varied countryside. Their open 4x4 Land Rovers allow close proximity to animals in the savannah and forested areas. The Vumbura area is possibly the only area in the Okavango where one can see Red Lechwe (an animal that inhabits the fringes of the waterways) and Sable Antelope (an animal that enjoys the dry countryside) on the same game drive. Add in Lion, Leopard, Elephant, Cheetah and Buffalo along with all the plains animals and one has an excellent all round wildlife experience in a remote and private part of the Okavango. Birding too is great with large varieties and quantities. Walks, mokoros and boating give Vumbura Plains' guests the opportunity to enjoy Africa from a different perspective.